18/02/2012 at the Department of Pediatrics postgraduate (head. 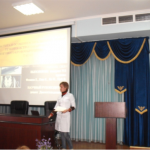 I.V.Brezhneva) competition was held scientific and practical work. Purpose: to demonstrate the results of practice and skills in research. Participated interns-pediatricians — 702, 704, 706, 707, 709, 710, 711, 712, 713, 715 groups, who spoke with scientific reports. Topics reports — birth defects of the gastro — congenital malformations of the gastrointestinal tract, diffuse connective tissue diseases in children , the structure of infant morbidity and mortality, etc. 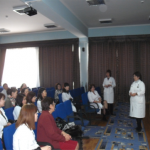 The reports reflect the results of their practice and research under the leadership of the department faculty and physicians in the regions of practical training — Taraz, Uralsk, Taldykorgan, Almaty region. Results of the competition: determined the 4 most interesting and successful work of interns, who were promoted to the third stage of the competition «Best Graduate KazNMU» and the competition, dedicated to the memory of professor Z.H.Mazhitovа.